The destruction of Jarrow happened before I was born, and it was my grandfather who waved the marchers off, unable to march himself because of the open wound in his leg, an injury from the first world war that had never healed in a world before antibiotics. We moved from Tyneside when I was four, and most of my memories of Jarrow involve visiting relatives, though I will always remember the excitement of the toy shop at the bottom of Ellison Street. In 1964 we left Jarrow for Corby, a steel town in the middle of Northamptonshire, moving onto the Exeter Estate which had been built in the 1950s to provide good homes for the steel workers who had moved to Corby from Scotland when the works in Coatbridge closed. A year later my dad left, and my mum raised my sister and me. Dad turned up at weekends, more or less regularly, and paid my mum some money each week for ‘housekeeping’. She worked as a school cleaner and dinner lady, because it wasn’t enough to live on. I remember what happened in 1980 when government policy decreed that British Steel should ‘rationalise’ and the choice was made to close the tube works that employed the majority of working-age men. I’d just left to go to university. I didn’t return, because there was nothing there for me by the time I graduated – job opportunities for philosophy graduates weren’t thick on the ground to start with, and a Northamptonshire town with over half the adult males out of work didn’t seem like a good prospect. Like John Burnside [https://en.wikipedia.org/wiki/John_Burnside], Bill Drummond [https://en.wikipedia.org/wiki/Bill_Drummond], and Salena Godden [https://en.wikipedia.org/wiki/Salena_Godden], I moved from Corby. The people who live in Corby, like those who live in Jarrow, are strong, resilient and resourceful. Both communities held together, and initiatives like Made in Corby [http://www.madeincorby.co.uk/] offer a chance to remember and build on the past, and to acknowledge the poverty and pain that they felt than, and which still persist. I’ve thought about my personal journey through industrial devastation many times, but I was prompted to write by a confluence of events. 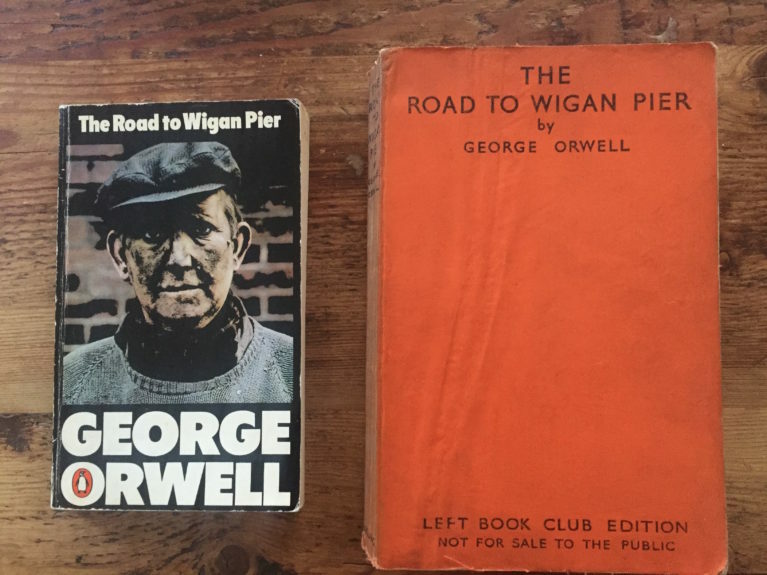 This Christmas my wife Katie gave me a copy of the first Left Book Club [https://en.wikipedia.org/wiki/Left_Book_Club] edition of The Road to Wigan Pier, published in 1937. Wanting to re-read it but worried about damaging the old book I reached for my Penguin copy [yes, of course I know where all my Orwell books are on the shelf. Don’t you? ], the much-loved black spined edition. And I noticed that it had been a gift too, from my girlfriend Liz, in 1978. The original was published 79 years ago. My personal copy is 38 years old, or almost half its age. I felt old – but then I read it and the clarity of the prose, the shocking degredation of the lives of those described in part one, and the anger and spirit of part two struck me, as fresh and relevant now as they were when Orwell first wrote. Inspired by Orwell, I then learned that this year’s AV Festival [ http://www.avfestival.co.uk/ ] in Newcastle & Gateshead was shaped by eightieth anniversary of the Jarrow March and the world described in The Road to Wigan Pier, and it seemed that the past was calling out for a response. The poverty described by Orwell and the despair captured by Wilkinson may be history, but the suffering of those who grow up without resources, trust funds, good teachers, safe housing, secure health or supportive families and access to opportunities continues, and their lives are getting worse every day. We have to work towards a world in which all can live without fear – of poverty, of ill health, of homelessness. It’s a good question, one Orwell and Wilkinson asked eight decades ago, one that we can usefully ask again today. The programme for AV [http://www.avfestival.co.uk/programme/2016?category=all] is as international as you would expect from director Rebecca Shatwell, whose inclusive vision has always been an inspiration. There is much on offer to stimulate thought, but I hope it also stimulates some action, because the time for action has already long passed and we still seem to be stuck in a period of indecision.